Awesome R5 you got! 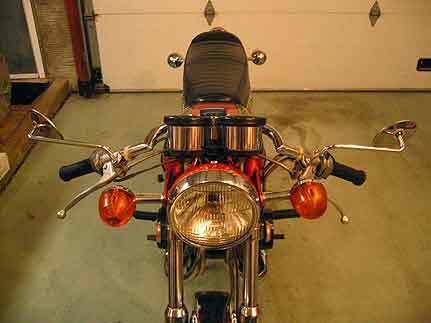 Where did you get your cafe racer handlebars and mirrors? Also, does your bike seep oil from it's pipes? If so, any tips on how to correct that? Thanks! I replaced the stock bars for lower, somewhat uncomfortable (until I added rearsets) but much better looking cafe bars. The bars are clubman-style, non-adjustable, similar to this. You can find them just about everywhere, in a few different styles and finishes. Just make sure you get the right diameter for the Yamaha. Note: In order to get the clutch lever off the stock bar, I had to cut off the stock hand grip. I tried not to, but the sucker wouldn't budge. Once the one was cut, well, I went ahead and replaced them both with ProGrip 699 Superbike grips. They have a good vintage look to them, and are pretty cushy to soften vibrations. I simply took an Xacto to the grip ends and trimmed myself a hole on both sides to make way for the mirrors. Now about those bar-end mirrors... while looking great, no matter how much tightening and adjusting, they just never stayed put. The one thing I could count on was a good view of the ground behind me or my armpit - not good when you actually need to check your background for a quick lane change. They may have just been the brand I ordered (Napoleon), so your mileage may vary. Anyways, I decided to remove the bar-ends, replace the stock endcaps in their stead, and remount the original stock dental mirror. I managed, after quite some searching, to find a NOS right-side mirror. It didn't quite fit, but with a little Loctite and some swearing I made it work. The stock left mirror that came with my bike is convex, so it gives me a greater viewing area on my passing side, while the right mirror is flat and just gives me a direct view of what's behind me. The way they're mounted (into the threads on each lever) they are high enough to be useful but not look like antennae, in keeping with the whole cafe racer aesthetic. As for oil seeping from pipes, I do get a drip or two now and again, same from the case bottom. Nothing too serious. If you're having more than that, I would look into it... anyone here have any suggestions? When I got my bike it had leaky carburetor float valve needles. So, fuel would endlessly drip into the cylinders where it would leak into the exhaust pipes. Then it would mix with soot and drip out as a black, oily liquid. So, does your tank run dry when you let the bike sit overnight with the petcock on? When I bought my R5 the carburetor bowls would overflow. They constantly dripped into the cylinders, where it leaked out into the exhaust and mixed with soot, producing a black, oily mixture that dripped out tailpipes all the time. It looked a lot like oil to me. Does your tank run dry when the bike sits? If so, you need to rebuilt the petcock and/or carburetor float needle valves. The Greatest Machine of All. 1972 R5C AMA Homologation Special? Fork Lock on a 1970 R5?